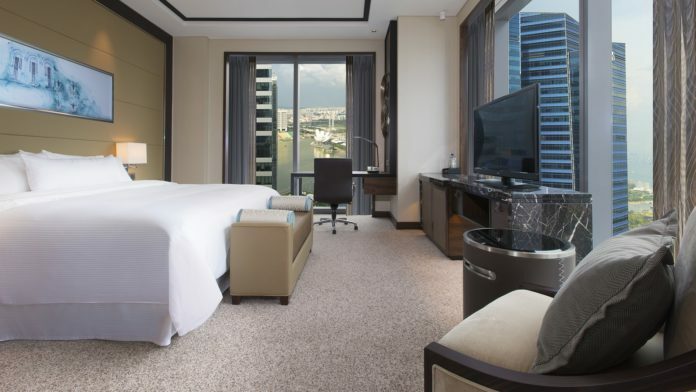 TEN hotel brands under Marriott International are offering event planners double Starpoints in the Starwood Preferred Guest (SPG) and SPG Pro loyalty programmes when they book a eligible catered event between today and February 28 next year. The new Toast Twice promotion draws participation from over 1,300 hotels and resorts around the world, spanning the brands of St Regis, The Luxury Collection, W, Le Meridien, Westin, Sheraton, Tribute Portfolio, Aloft, Element and Four Points. In Asia-Pacific, the Toast Twice promotion is available in more than 300 participating properties in over 20 destinations. Two Starpoints will be given for every US$3 of eligible revenue spent on catered events, including those hosted in the hotel’s dining outlets and offsite catered events. For instance, an SPG or SPG Pro member who spends US$18,000 for guestrooms, event space and catered F&B will earn 6,000 base Starpoints and 6,000 Toast Twice Starpoints as a Preferred member; 6,000 standard Starpoints, 3,000 Elite Bonus points and 6,000 Toast Twice Starpoints as a Gold or Platinum member; or 6,000 standard Starpoints, 3,000 Elite Bonus points, 3,000 Elite Bonus points for having SPG 75 Nights Benefits, and 6,000 Toast Twice Starpoints as a Platinum member with SPG 75 Nights Benefits of higher. To qualify for the double rewards, events must be booked through the sales office, consist of either a dining or catering component only or be combined with a booking of nine guestrooms or less. To qualify for the Toast Twice promotion, SPG and SPG Pro members should register at spg.com/toasttwice by February 28, 2017. Email mice@starwoodhotels.com for more information. Meanwhile, Marriott International is looking at creating a broader MICE rewards programme that will span all brands under both Marriott International and Starwood Hotels & Resorts Worldwide following the completion of the mega merger on September 23, according to Mei Xueying, Starwood’s Asia-Pacific manager, customer loyalty and communications.